An Enterprise Architect Project is a repository for storing, manipulating and managing one or more Models. A single repository can contain many models, and a Repository can be either file based, hosted in a larger DBMS system or based in the Cloud. A project can contain a single model, or a number of models, each of which defines a particular system or process. A model contains the diagrams, elements, relationships and associated metadata that define the structure and function of the system or process. These components are organized into a hierarchy of Packages, which help to group and manage related components. Different aspects of the process or system - or their development - are defined by Model Packages, which you generate from templates specifically structured to support the aspects that the Model Packages represent, such as requirements or deployment. You can generate these templated Packages at any level of the hierarchy, but as they are created with their own content they are more useful at the top levels. The top-level Packages in a model can also be Views, which represent partitions of the model that you define yourself. 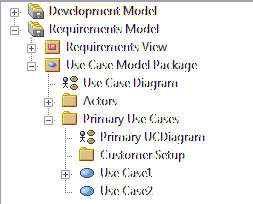 You can start with standard Views such as Class or Component, or create whatever partitions are appropriate to your model. It also contains the Use Case diagram, which could be an overview of the Package structure or function. Each subordinate Package also contains diagrams, elements and (if necessary) further Packages; the elements are related by connectors created in the diagrams, and each element and connector has properties, attributes, operations and extensions defined in the respective 'Properties' dialogs. Note that models do not have to be constructed this way. Depending on the methodology you are following and information you need to model, the project structure might look completely different. In addition, many architectural frameworks such as TOGAF and ArchiMate specify their own project structure as part of their overall solution architecture.